Seasonal fruits are perfect for making cocktails. 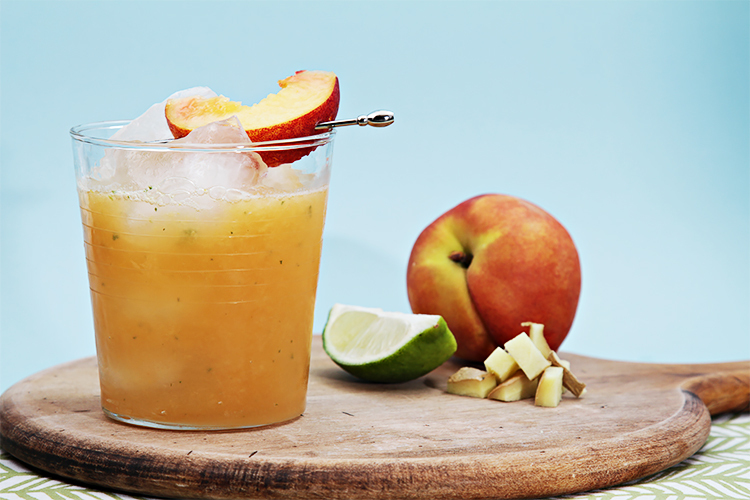 This week’s mojito is made with ripe, local peaches. It’s light, refreshing and… as you can imagine… incredibly delicious! Step 1: Place the lime, ginger, mint leaves and sugar in a mixing glass. 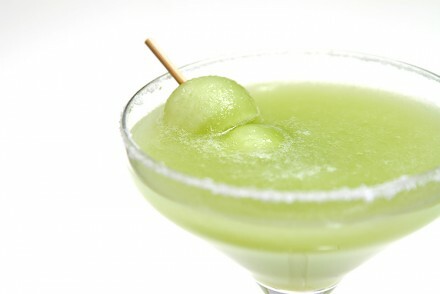 Using a muddler, crush the ingredients until the sugar has dissolved and the lime has released its juice. Add the peach and continue to muddle until the peach is well mashed and has released its juice. Top with ice cubes, rum, liqueur and bitters. Shake vigorously until very cold. Step 2: Place a few ice cubes in 2 tumblers. Strain the mixture into the glasses. 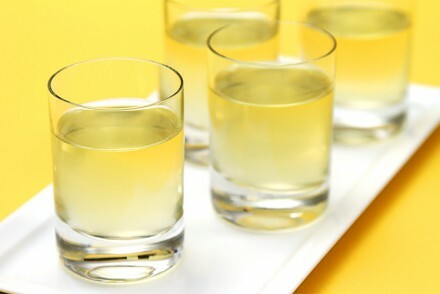 Top with a little club soda or sparkling water (the proportion should be 3 parts drink to 1 part club soda). Garnish with a peach slice and serve immediately. This sounds amazing! I would love one of these mojitos, especially with the heat we are having here! So refreshing! Love the addition of the ginger! Thank you Amy! I’ll be making these mojitos until peach season is over… thank goodness there’s a few more weeks to go! 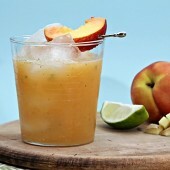 I think about peaches lately so I love the idea of using them in a mojito! Keep them coming Viviane. It’s been a long hot summer and they all look refreshing! Looks like peaches are everywhere these days. Loving the idea of this mojito specially with that ginger kick! I spotted the perfect Mojito glasses at ZGallerie this weekend; what a synchronicity! They were made for this drink! Sandra! You have a good eye… I love how generous the glasses are. Lots of room in there for ice cubes. There’s nothing better than a super-chilled mojito. Cheers! What a fantastic flavor combination! I can’t wait to make this tonight! Thanks for sharing! This definitely sounds like the perfect drink to quench my thirst in this awful heat! 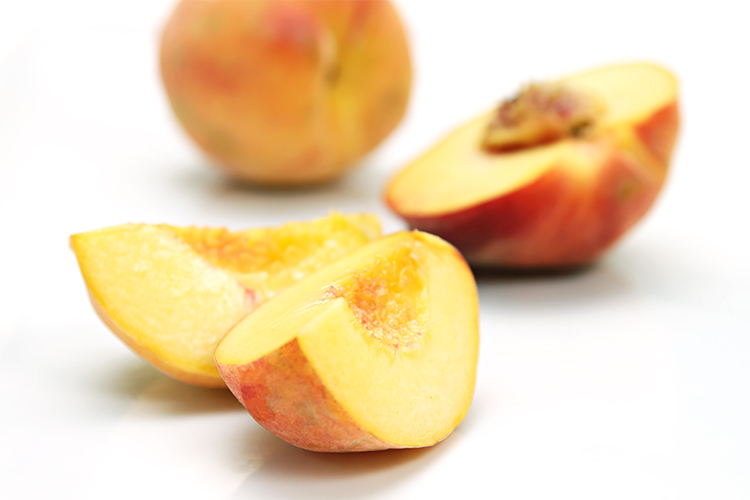 And we received loads of peaches in our CSA this week, so we should be good to go! Janet, Sheryl, Ann… Thank you ladies! The mojito is my favorite drink, but I’ve never had this flavor combination. Gotta try it! Oh, I love a good mojito! I have a muddler, but not like that one! Awesome post! Thank you for your comments everyone! It’s 103F in my neck of the woods today… And I just got back from my local farm with 10 lbs of ripe peaches. Guess what I’m making tonight?! What a refreshing cocktail. It would taste so good on a hot day like today. I love homemade cocktails with fruit, and I especially love peach mojitos! This looks like the perfect summer drink! 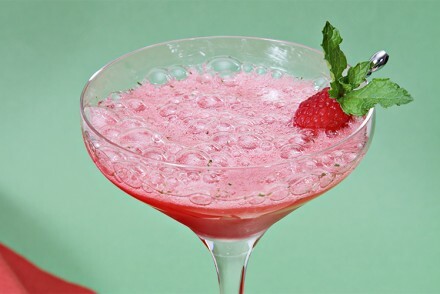 The gorgeous photo had me salivating for this refreshing summer cocktail, especially in this brutal heat. Cheers!